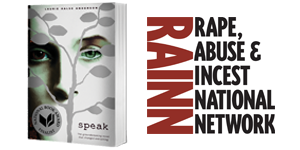 I am very happy to announce that Macmillan (SPEAK’s publisher) and I have partnered with RAINN (America’s best anti-sexual violence organization) to create the SPEAK4RAINN campaign! Get your students involved. Have them enter the “How SPEAK Spoke To Me” Creative Contest. Fundraise in your school for a chance to have me come and give a free school visit. All month long I will be sharing information about ways to reduce the amount of sexual violence. If we all speak up and remember to listen, we can change the world. Attention Writerlady Friends Who Live in the Washington, DC Area!!! You can help those who have been affected by sexual violence TOMORROW!!! Join host Christina Ricci on 9/9 for a special fundraiser for RAINN – the nation’s largest anti-sexual assault organization. Get your tickets now! Attention All Other Writerlady Friends!!! You should make a donation to RAINN just because they are THE BEST resource for survivors of sexual assault. EVER. Whenever I talk to or write to survivors of sexual assault, I always recommend they contact RAINN. Many of these readers got back in touch with me to tell me how helpful RAINN was, and how much better they are doing. Personal note of pride: I am a platinum sponsor of tomorrow’s RAINN event.